Boy, was I surprised when I downloaded these images to my computer! Because of the darkness, I didn’t see details of the fight at that moment. What I’ve noticed though, was that the buck on the left was very aggressive towards the other one. Looking thru the images on the computer I was stunned! Regardless of my excitement, on seeing my first buck’s fight, I felt very sorry for the older buck, the one on the right. Even though he is disabled, he still has to fight for his life and territory. 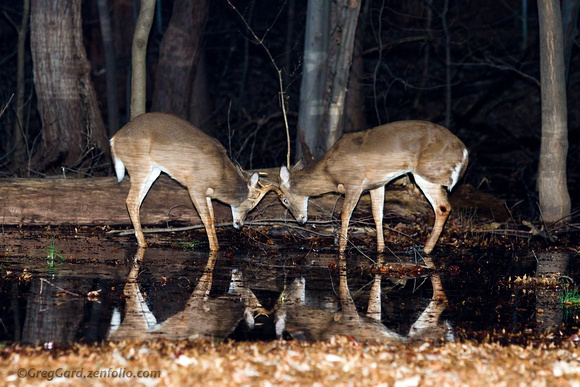 Whitetail bucks, Bergen County, NJ©Greg Gard - greggard.zenfolio.com - Canon EOS 7D, 70-200mm F2.8, ISO 1250, 1/100s, f/4 Manual mode, 580EXII flash - Handheld - Cropped Frame. 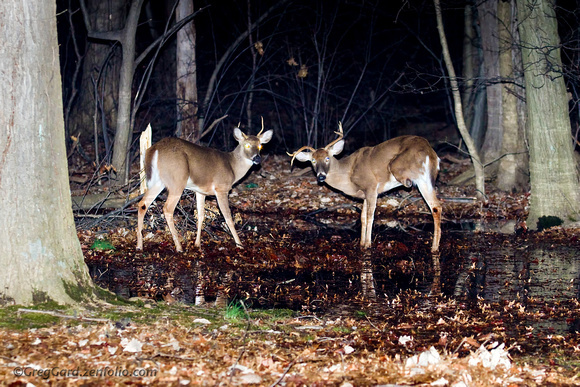 Whitetail bucks, Bergen County, NJ ©Greg Gard - greggard.zenfolio.com - Canon EOS 7D, 70-200mm F2.8, ISO 2000, 1/30s, f/3.5 Manual mode, 580EXII flash - Handheld - Cropped Frame. What did you notice about the buck on the right? Should I report to the park authorities that there is disabled buck in the area?